We had a lot of fun working with Jove Meyer creating menus and place cards for the Planners Dining Club! Jove puts together beautiful events just for planners in the New York City area to foster community and collaboration in the creative community. A small group of planners gathered for a colorful dinner at Naturally Delicious' private dining room in Brooklyn to experience their incredible catering, and spend an evening getting to know fellow planners in their industry. 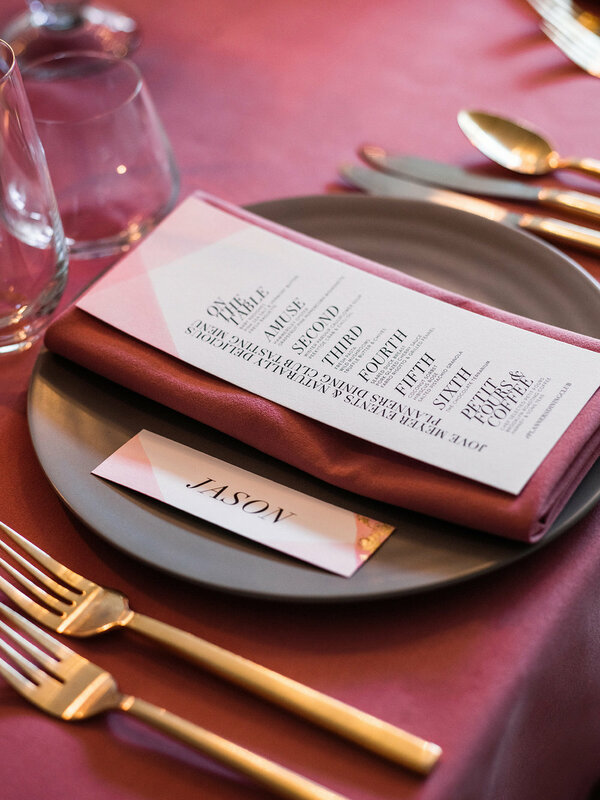 For this gorgeous event, we created dip-dyed pink menus, with coordinating place cards for each guest. Each one was hand dipped and unique! The place cards featured just the right touch of shine with a few flecks of gold foil. As seen on The Venue Report.